This is the page where you can begin to add your contribution to the vinceunlimited experience. Send me a comment using the link below. Go on, you know you want to. It won't hurt. In fact you'll feel a whole lot better for getting it off your chest. It will be an unburdening. A relief. A pleasure. In fact it is so good for you that I might start charging for it. In fact I will. That will be ten pounds please. After tax, import duty, web charges, interest and miscellaneous rounding I now make it five hundred pounds. In used notes. So come on, come on. Don't be shy. Get your wad out and slap it down on the desk. I'll even offer a five hundred pound discount, so it won't cost you anything. You can comment on any page, idea, opinion, photo or blog. It's your free choice. 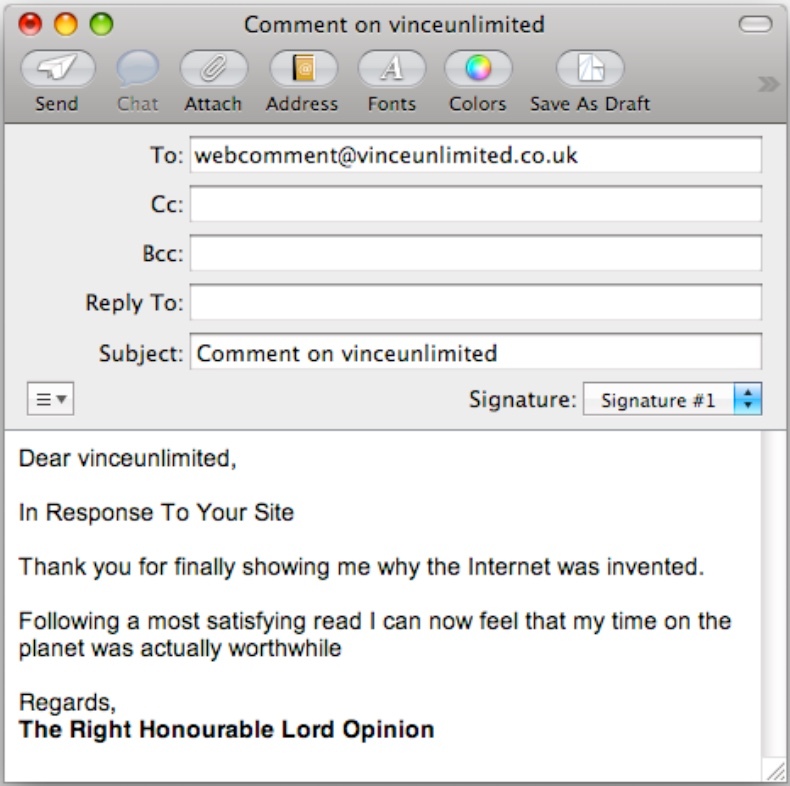 To do emailing just click the link below to send a web-comment straight to the heart of the vinceunlimited operation, where a luminary no lesser than Vince himself will assess it's true value and also whether to add your narrative to the great content collection. Please let me know which page you are commenting on.